The old gang is getting back together for Terminator 6. Much more a sequel than a true reboot, original creator and director James Cameron is producing, Arnold Schwarzenegger is back as the man who inspired the T-800 cyborg. 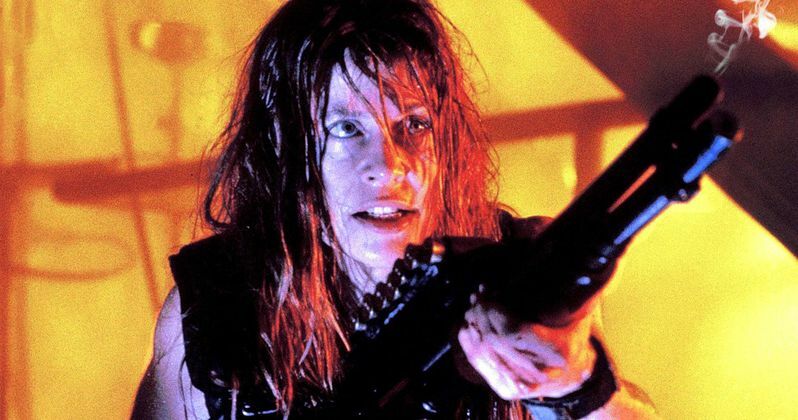 And now it has been confirmed that original Terminator star Linda Hamilton is returning to play Sarah Connor yet again. It's a reunion that has been 25 years in the making. Linda Hamilton starred in the original James Cameron directed Terminator that debuted way back in 1984. And she reprised the role of Sarah Connor in the sequel Terminator 2: Judgment Day, which arrived in 1991 and was just re-released in theaters after a 3D conversion. Skydance and Paramount are releasing Terminator 6 in theaters. James Cameron announced Linda Hamilton's return at a private event celebrating the franchise, which was attended by The Hollywood Reporter. He had this to say. "As meaningful as she was to gender and action stars everywhere back then, it's going to make a huge statement to have that seasoned warrior that she's become return." With Sarah Connor returning to the movie franchise, and Linda Hamilton playing her after Emilia Clarke assumed a younger version of the character in 2015's Terminator Genisys, James Cameron hopes to once again make a statement about gender roles in action movies. Cameron is busy directing Avatar 2 at the moment, so he'll only be producing. He says this about what he's crafting behind the scenes. "There are 50-year-old, 60-year-old guys out there killing bad guys, but there isn't an example of that for women." Deadpool director Tim Miller was confirmed to be directing this latest sequel in the long running and storied franchise. It will be his second film as a director. James Cameron hasn't been involved with a Terminator movie since 1991's T2. He will be producing alongside Skydance. While Paramount will distribute the movie domestically, Fox is handling everything overseas. Cameron is crafting the story from an original idea. He and Miller have a writers' room hammering out the script. The new movie is said to be launching a trilogy, with each movie standing on its own, yet also having an overarching interconnected story. Along for the ride will be David Goyer who famously worked on the Dark Knight movies with Christopher Nolan, Charles Eglee who created Dark Angel with James Cameron, and Josh Friedman, who created The Sarah Connor Chronicles TV show. Arnold Schwarzenegger is back and said to be playing the guy the T-800 terminator is based on this time around. Arnold has been the one constant in all of the Terminator movies, with Linda Hamilton and James Cameron sitting out the installments that showed up in 2003, 2009 and 2015. While James Cameron is the one who dropped the news that Arnold Schwarzenegger will be playing the guy who inspires the T-800 killer cyborg, the rest of the story is being kept completely under wraps. The movie is being considered a direct sequel to Terminator 2: Judgment Day. And themes of evil technology will be at the forefront. While all the old characters are returning, James Cameron also intends to have a set of new characters, as the old gang passes the baton, much in the same way Star Wars: The Force Awakens did with its mixing of an old and new cast. Says Cameron. "We're starting a search for an 18-something woman to be the new centerpiece of the new story. We still fold time. We will have characters from the future and the present. There will be mostly new characters, but we'll have Arnold and Linda's characters to anchor it." It isn't clear at this time how the other movies will tie into this new narrative. Or if the timeline is being wiped clean for a fresh start. There is no mention of whether or not Ed Furlong or Robert Patrick will return yet. No shooting start date has been announced, but things will get under way sometime in 2018 with a 2019 release date being targeted.